I’ve been planning to write this for months, and I’ve done everything I could to put it off. The reason for that is because I am afraid to write it. No matter what I write, I’ll never get across the thing about Tom Spanbauer’s writing that touches me so deeply. The sensation of reading his books is that, while you’re reading them, it’s like he’s placed his hand on your chest, the warmth and pressure and intimacy of it reassuring you that you are alive, and you are not alone. That doesn’t cut it. It gets close, but it’s not there. The best I can do is approximate. I think Rob does get pretty close. I’ve written about Tom before. His latest book, I Loved You More, was one of my favorites of 2014 and just won a Lambda Award for gay general fiction. 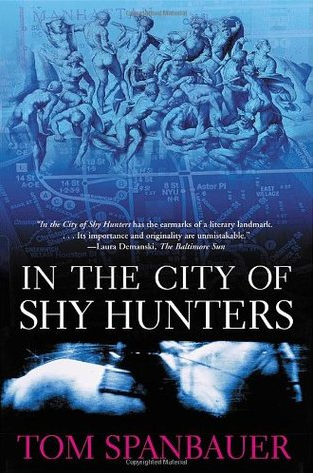 In the City of Shy Hunters is his AIDS classic, about New York in the early days of the epidemic. The hero, Will, is a Spanbauer stand-in who shares many points of his biography. He’s a gay man from Idaho who has come to the city to search for a lost love, a Native American named Charlie Two Moons. Charlie is a drop-out from the writing program at Columbia, and as the novel progresses and Will doesn’t find him, we begin to fear that he won’t, and that Charlie, like nearly everyone else, is a casualty of the epidemic. I had to sit down right there on the curb, my head between my knees, my sensible black shoes on New York City pavement. Big sobs, snot running out my nose, my chest up and down, up and down. Who knows how long I sat there. I’m still sitting there. I can’t think of a more generous and ongoing way of keeping a person in our hearts. Even the dead are not alone, thanks to Spanbauer’s wonderful humanity. I felt I belonged there in my seat. Things had meaning and purpose. Fiona and Harry were my friends and they were up there on the stage and the audience was waiting—you could feel the anticipation, the hope of theater to lay bare the human heart. And I was there, I wasn’t in Jackson Holeewood or Boise, I was avant-garde in Manhattan in a basement theater on the Lower East Side. The New York one can write things like this about has vanished as well. Your review and the review you shared both make me want to read this book. Cool! I found I Loved You More to be slightly more accessible, masterful and intense than In the City of Shy Hunters, though the latter is the famous one. Thanks for reading my blog! I like how this post goes from distant to immediately present. I think I know this author from the anthology MFA vs NYC.